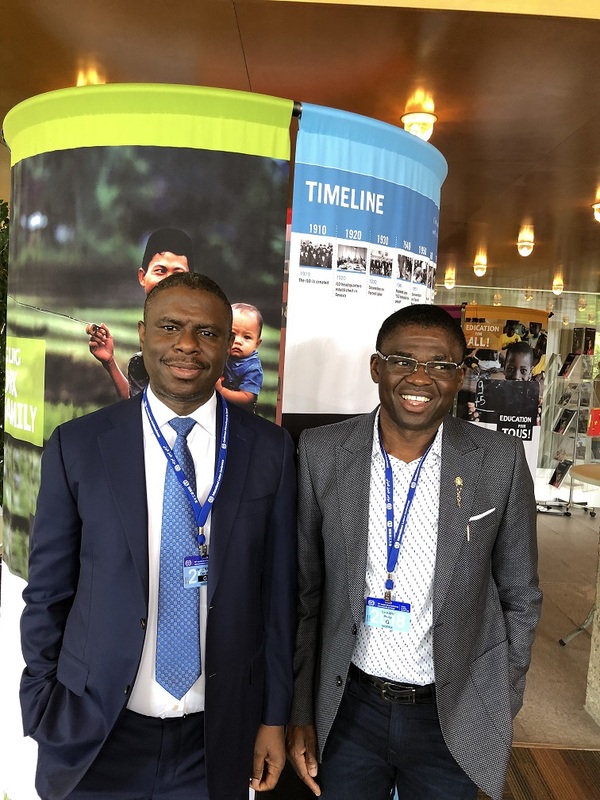 Director General, Nigerian Maritime Administration and Safety Agency (NIMASA) Dr. Dakuku Peterside and Deputy Governor, Edo State, Nigeria, Mr. Philip Shaibu at the ongoing International Labour Organization (ILO)Conference in Geneva, Switzerland. The Director General of the Nigerian Maritime Administration and Safety Agency (NIMASA) Dr. Dakuku Peterside has stressed the importance of human factors to successful shipping, stating that it is one of the most important elements in achieving competitive edge and safety in the maritime industry. Dr. Dakuku made this known while addressing participants at the Business AFRICA meeting at the ongoing 107th session of the International Labour Organisation (ILO) Conference in Geneva, Switzerland where consideration for the review of Maritime Labour Convention (MLC) 2006 would be made. The DG who noted that the industry must partner with workers to develop a strategy that will contribute to the constant development of Human Resources in the sector said that investment in workforce is a sure way to guarantee success of firms and boost profitability. According to him, “employees are the most critical factor that determines the success of a firm, this is even truer in the Maritime industry that is capital intensive and where safety is paramount so constant training and development as well as welfare of workforce must be taken seriously“ he said. He further urged AFRICAN businessmen to pay great attention to welfare of workers in order to be able to compete favourably in the international market adding that the maritime industry in particular could play greater role in the economic growth of third world countries if the right investment is made in the sector. He commended the International Labour Organisation (ILO) for the review of Maritime Labour Convention (MLC) 2006 and also advised that considerations should be given to peculiarities of the different geopolitical areas of the world in the amendments, adding however that after 10 years, the MLC 2006 ought to be reviewed to meet the challenges of emerging trends. It should be noted that the MLC is an International Labour Organisation convention established in 2006 as the fourth pillar of international maritime law and embodies all up-to-date standards of existing international maritime labour Conventions and Recommendations, as well as the fundamental principles to be found in other international labour Conventions. The convention entered into force on 20 August 2013, one year after registering 30 ratifications of countries representing over 33 per cent of the world gross tonnage of ships. As of August 2017, the convention has been ratified by 84 states representing over 89 per cent of global shipping.